A pottery beckoner found by Larry & Barbara in San Francisco (Shiki, Japan Center) and brought back to me instead of a crummy ole t-shirt, lol! He has several different colors of glaze on him, but his most outstanding feature is the ash & sand on the outside which give him a unique appearance & an interesting texture. 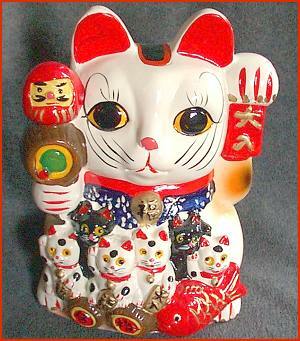 5 1/4" (13.25 cm) tall, bears an oval silver label on the bottom that says "SAN FRANCISCO / SHIKI / MADE IN JAPAN". 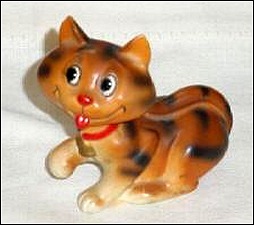 A cute tiger-striped Happy Cat with a red painted collar & gold painted bell. Ceramic, 3.5" (8.5 cm) tall, with salt-shaker holes behind his head & a plastic stopper. He sports an oval gold & red "JAPAN" sticker and a code "H993" (Norcrest) underneath. 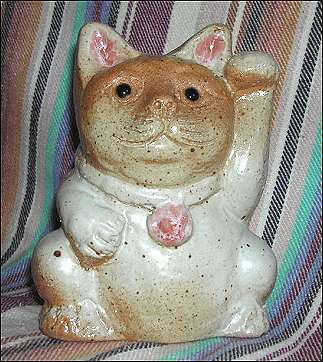 I think of this sort of kitty as a "near-manekineko", in the same sense that "near-beer" is almost, but not really, beer. (This is what happens when you don't spay/neuter your cat! LOL!) A large & very crowded figurine, it has 1 large Maneki & 6 small ones, a Lucky Tai Fish, a Daruma doll, gold coins, a magic Daikokuten mallet, & more! A big 12" (30 cm) tall, brightly-painted, super lucky, ceramic bank. Has a "Made in China" sticker on the bottom. Purchased in Pigeon Forge, TN, 2003. 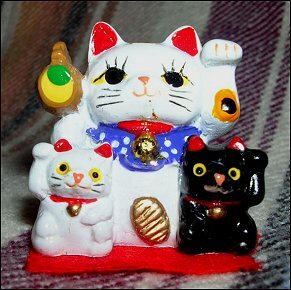 A little-bitty Maneki group-figurine for contrast. This one is only 1 1/8" (3 cm) tall. From Chou's Imports, Memphis, TN, 2004. No ID marks.